In a large bowl, stir together the milk, margarine, warm water, sugar and yeast. Let stand for about 5 minutes. Mix in the salt, and gradually stir in the flour until you have a soft dough. Divide into 25 pieces, and form into balls. Place on baking sheets so they are 2 to 3 inches apart. Let rise for 20 minutes. Preheat the oven to 375 degrees F (190 degrees C). 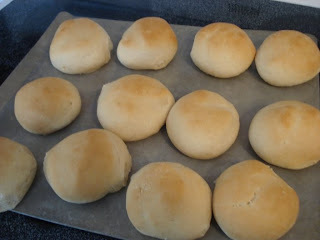 Bake the rolls for 15 minutes in the preheated oven. Cool slightly, then split them in half horizontally to fill with your favorite burgers.